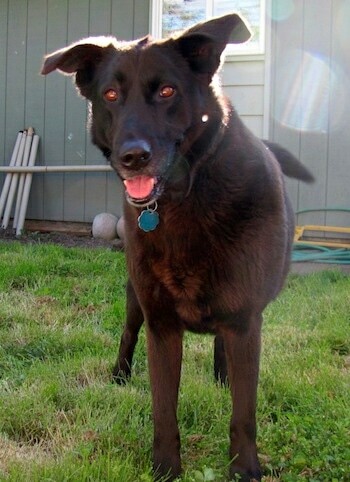 "This is Abby, my Wolador (Timber Wolf / black Labrador) at 6 years old. She was the youngest in her litter and the only one that looked similar to a Labrador. However, every year her fur is becoming more wolf-like, having more burnt red/brown in her coat. In the winter she has a full coat with highlights (more like splotches) of the burnt red color mixed in with black. "She is very sweet and affectionate to her family, weary of strangers at first, but then warms up to them easily (especially when they have a dog treat). She chases almost everything, including birds flying way above her, bugs, squirrel, some cats and rodents. She is very expressive in her face and will "talk to you" through guttural sounds. "When she lies down she crosses her front paws. Also, she has never eaten out of her food bowl; when we put food in it she tenderly (literally) flips it over with her paw.... Once we tried just putting the food on the ground and she wouldn't eat it. We also tried a "non-tip bowl." She figured out how to tip them :)! The funny thing is she has partially webbed feet, but HATES water...won't go near it unless it is in her water dish. Even at the lake she won't go in it unless to get a drink. "Because she is a wolf, she likes to howl. Especially when sirens go by. I love that she is so affectionate, and ready to play at all times. Also, she is pretty easy maintenance; she does shed, but with daily brushing it is not bad. "She takes sandpaper and chews it. If our garden hand tools are not put safely away she chews the soft rubber off. "I take her on a 3-mile run every week and a long walk about twice a week. She should have more in my opinion, but it is enough to keep her content. She pulls on the leash (more my fault than her's). We play daily with her and her ball or tug rope (those are her favorites!)" The Wolador is not a purebred dog. It is a cross between the Timber Wolf and the Labrador Retriever. The best way to determine the temperament of a mixed breed is to look up all breeds in the cross and know you can get any combination of any of the characteristics found in either breed. Anyone owning a Wolf Hybrid should take extra time to learn the animal's natural instincts and behavior. Not all of these designer hybrid dogs being bred are 50% purebred to 50% purebred. It is very common for breeders to breed multi-generation crosses.